Rule 1: You do not talk about Fight Club. Rule 2: You DO NOT TALK ABOUT FIGHT CLUB!! CLAUSE: Now if you happen to mention it by accident and people become curious, start patting around your pockets like you can’t find your keys and get the hell out of there. Rule 3: If someone says “stop” or goes limp, taps out, the fight is over. Or if they yell “Cowabunga!! !”, the fight has just begun. Rule 4: Only two guys to a fight. Not three, not four. Not five, six, or seven. Not even eight. Rule 5: One fight at a time. Rule 6: No shirts, no shoes? No service. Rule 8: If this is your first night at Fight Club, you have to fight. Unless you don’t want to and you have a note from your doctor. Rule 9: For the guy who keeps playing “Yakkity Sax” from “The Benny Hill Show” on his ghetto blaster during fights, please, keep doing it. Rule 11: Dues are collected on the third Wednesday of each month, and that reminds me, we’re going to need some volunteers for the Mother’s Day brunch. Sign up sheet is over there on the floor, for some reason. Rule 12: Please start talking about Fight Club with your friends. Our numbers have been dwindling and we need to increase the ad hoc health insurance we have going on here. Where’s the rule about crying? There’s gotta be a rule about NO CRYING IN FIGHT CLUB. No way I’m signing up for the Mother’s Day Brunch after the Valentine’s Day Speed Dating for Charity fiasco. Oh yeah, that was awful. I don’t get it. 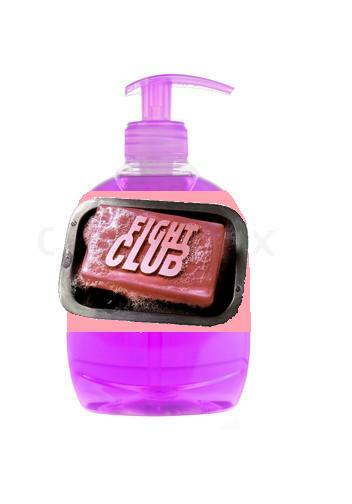 Do we talk about fight club or not talk about fight club? Maybe I should watch the movie first. You don’t talk about it but make sure that you do.